"I will fear no Evil". —. 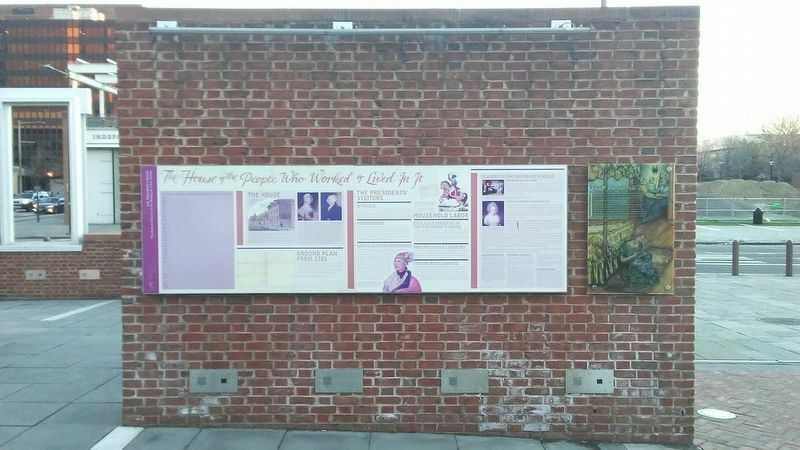 Many evenings, Oney Judge would sit on her pallet where she slept at the foot of Martha Washington's bed, sewing and listening to the First Lady read the Bible, sing hymns, and pray with her two granddaughters in the next room. 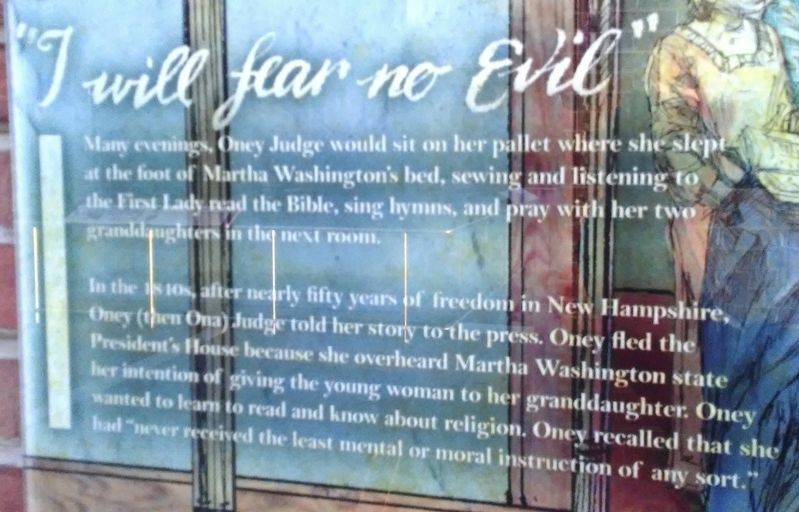 In the 1840s, after nearly fifty years of freedom in New Hampshire, Oney (then Ona) Judge told her story to the press. 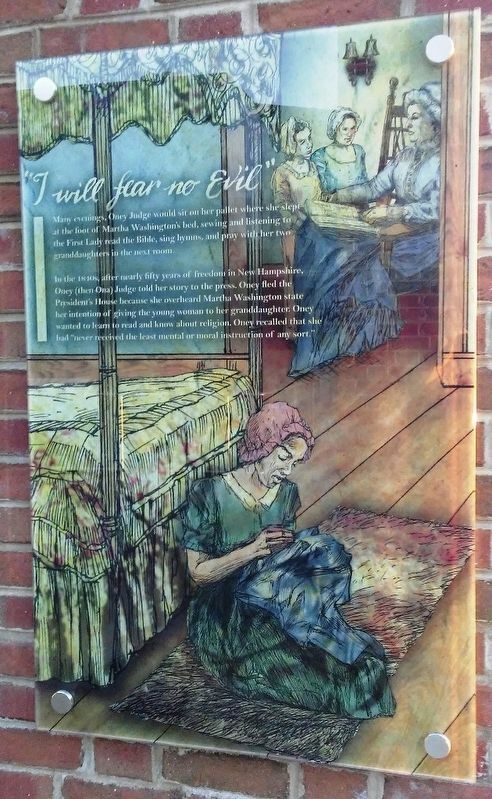 Oney fled the President's House because she overheard Martha Washington state her intentions of giving the young woman to her granddaughter. Oney wanted to learn to read and know about religion. Oney recalled that she had "never received the least mental or moral instruction of any sort." Location. 39° 57.029′ N, 75° 9.001′ W. Marker is in Philadelphia, Pennsylvania, in Philadelphia County. Marker is at the intersection of Market Street and South Independence Mall West (6th Street), on the left when traveling east on Market Street. Touch for map. Marker is at or near this postal address: President's House Site N of Liberty Bell Pavilion, Philadelphia PA 19106, United States of America. Touch for directions. of this marker. Suppressing the Opposition (here, next to this marker); "An Act respecting fugitives from Justice" (here, next to this marker); The House & the People Who Worked & Lived In It (here, next to this marker); The Keeper of the House (here, next to this marker); "We shall come to a civil war" (here, next to this marker); "I am free now" (here, next to this marker); "Burn this treaty to Hell!" (here, next to this marker); The opener of the Way (here, next to this marker). Touch for a list and map of all markers in Philadelphia. More. Search the internet for "I will fear no Evil". Credits. This page was last revised on March 26, 2017. This page originally submitted on March 26, 2017, by William Fischer, Jr. of Scranton, Pennsylvania. This page has been viewed 121 times since then and 11 times this year. Photos: 1, 2, 3. submitted on March 26, 2017, by William Fischer, Jr. of Scranton, Pennsylvania.